Honey Comb, Honey Comb Supplier, Gujarat, India. 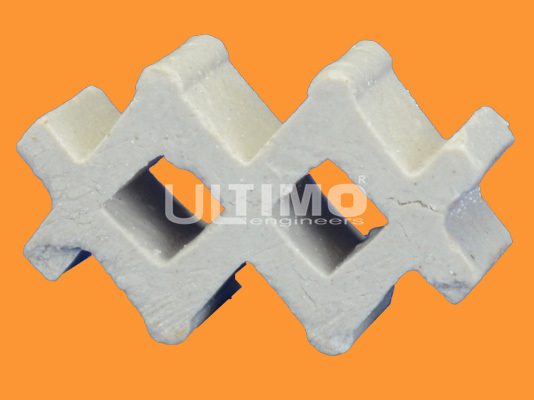 Ceramic block packing of Honeycomb type has been developed for the purpose of absorption and heat transfer processes in column apparatuses. The packing design ensures high efficiency at relatively low pressure drop. The packing is easy to manufacture and the ceramic is resistant to high temperatures and chemically aggressive environments. Detailed studies on the characteristics of mass transfer and fluid flow have resulted in development of a reliable methodology for design of packed columns for absorption processes and direct heat transfer. Their successful implementations in the chemical industry, for environmental protection, and in the power production have confirmed the validity of the methodology.